First off, I should say that it has really only been about 1.5 years that I’ve really been practicing in any way that could actually be considered proper Aunkai practice. Before that, it has been more so a matter of distance learning, or more accurately, observing from afar, as the first videos, interviews and articles about Akuzawa Sensei and his emerging method of Aunkai Bujutsu started popping up over the internet. Suffice it to say that I was curious, if not curiously hooked from the very start, once again for a variety of reasons at the time. Since then Aunkai has gradually gained greater and greater popularity and, next to the usual online bickering, left a positive impression on lots of people. 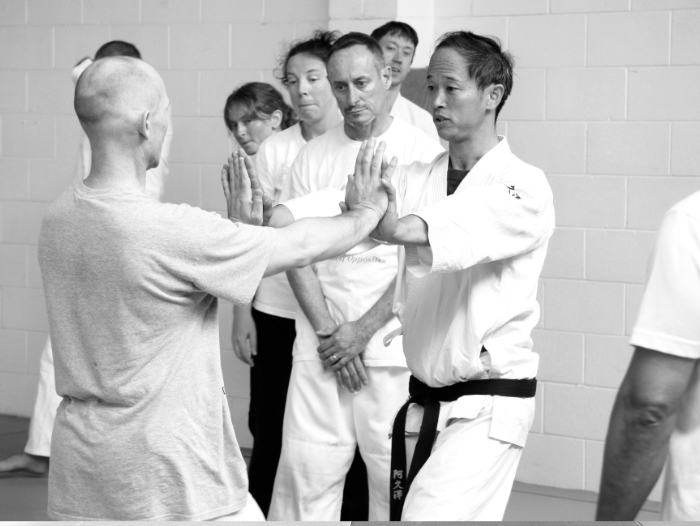 This has been in the course of brief encounters, as in the case of no other than Ellis Amdur himself, or over the course of continuous training over several years, as in the case of the various, growing Aunkai Dojos in France, that have undoubtedly developed into the largest and most stable base of Aunkai practitioners worldwide, outside of Tokyo. This growth, the increasing amount of material available and the possibilities that we have to connect with other people via the web today, finally enabled me to get in touch with Akuzawa Sensei himself at the end of 2013, invite him to teach a series of seminars in New Zealand, and then finally welcome him here for the first ever ‘Aunkai New Zealand Tour’ in November 2014. It’s really hard for me to summarize everything that happened and everything that I had learned during those two weeks of having Akuzawa Sensei and Manabu Watanabe (Hanshi, Aunkai Tokyo) here with me, traveling and training around the country, and spending time together both on and off the mat and the review immediately that I had written shortly after their departure by no means did it justice. In the same way, I don’t think I can, nor do I plan to do it justice in this post, let alone the entire time and the potential topics to write about as a result. For now, I’m merely setting out with the intention of chronicling somewhat of a timeline, and in the course of doing so, maybe broaching on some topics (like particular exercises, experiences, insights,…) that I might write about in greater detail in separate, dedicated posts later on. 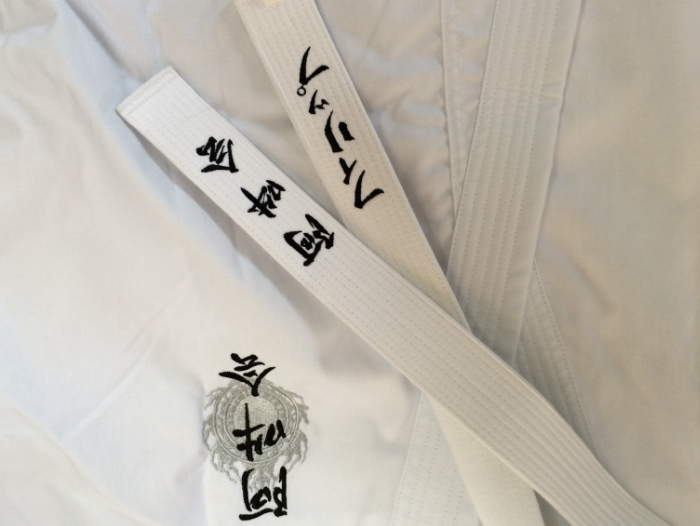 One anecdote that touches on such a topic and that I will briefly mention here is from a training session with Sensei, Manabu and myself at the beach around the corner from the last house I’ve lived in. 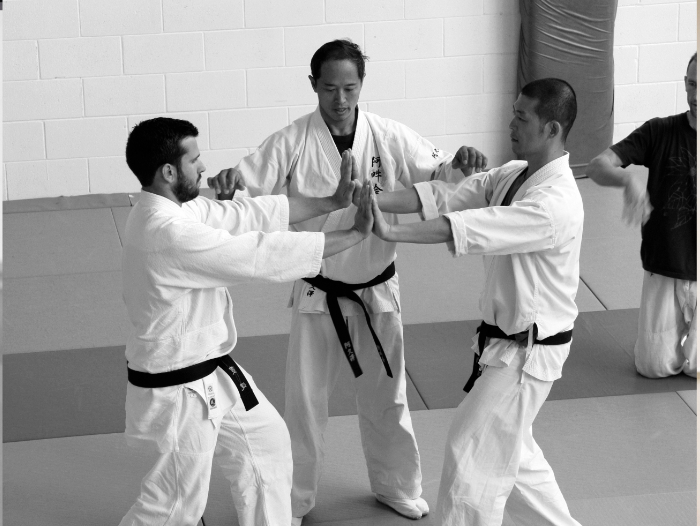 Specifically, this was a moment during which, under Sensei’s observation, Manabu and I were practicing an exercise that you can find on the Aunkai First Step DVD 3 – Applying the Frame. 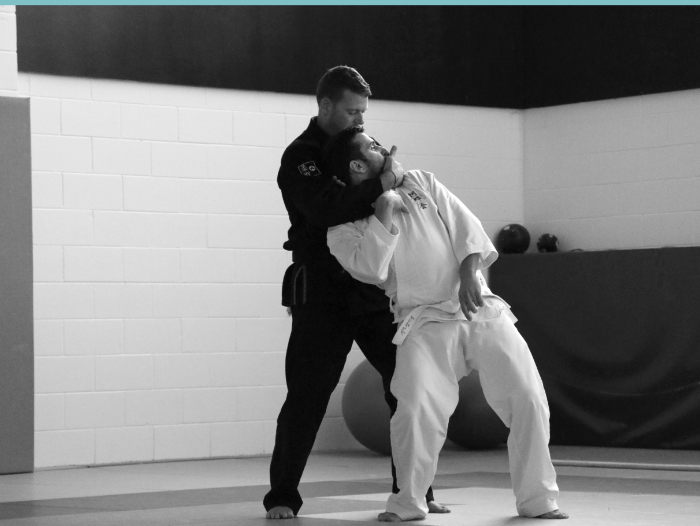 In its basic form, you face your partner head on and either deliver or receive an open palm strike to the front of one shoulder, focussing on doing so with or whilst keeping your ‘frame’ (I’m tempted to say that you might be better off understanding ‘frame’ as interchangeable with ‘form’, ‘relaxed structure’, ‘connected body’, ‘body as a unit’, or else, depending on your preferred terminology and primary art, form, or style). Now, I can’t for the life of me find a fitting picture online and am too lazy to gather the things I would need to make one myself, but you can think of it like feeling a very heavy (iron) ball, let’s say about the size of a large grapefruit, in the middle/bottom of a salad bowl (standing for your pelvis). 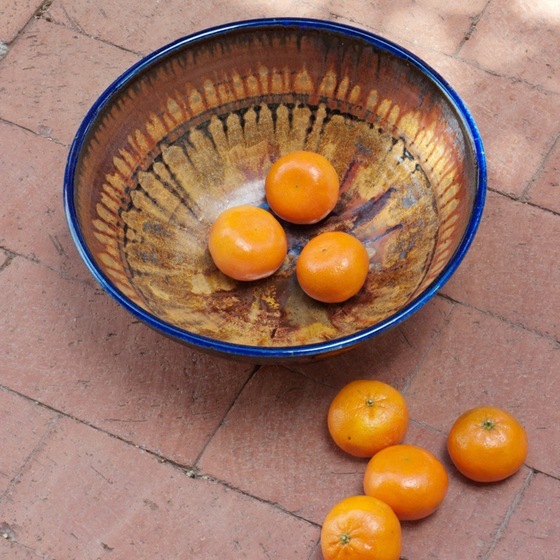 The picture here is misleading in terms of the size and number of fruits in the bowl (unless you count… ah, nevermind…), but it’s quite important that this is not just a sensation of the heavy center ball, but also the distinct contours of the bowl holding it. So the first sensation I had upon receiving Manabu’s strike was as if, say you imagine the bowl and ball behaving to each other a bit like a roulette wheel and ball, the ball in the middle came to drop and rest in the middle of this bowl, and of its heaviness bearing straight down toward the ground. The second sensation, in addition to and somewhat dependent on feeling the contours of the bowl, was that this ball was suspended from above, thus countering the downward pull of the weighted ball and providing it with a solid, as well as an open container to move in freely (if ignited, but that’s a different topic again). Put these together and think of your head (or higher) as the attachment point above and you get to an image that I have used repeatedly during classes and at seminar, that is, of a weight hanging underneath a buoy floating on the water surface, and both being connected by a very mobile, undulating string, i.e. your spine (actually, you can see the connecting elements in the picture undulating ever so slightly). The picture on the left is not ideal, so first off, replace the metal plate and split-string at the bottom with a single string and our salad bowl from above. Now instead of going into a discussion of the potential power generation through the linear, up- and downward tension and release depicted in the gif, imagine the buoy being pushed sideways along the surface of the water, much like Manabu’s push/strike to my shoulder (he thankfully didn’t punch me in the face in this instance :)), and then think about what happens with the string and weight underneath once the buoy comes to rest in its new place. Right, so the string swings and pulls the weight along with an undulation, and at least theoretically, this weight eventually comes to rest underneath its newly placed suspension, thus restoring their initial relation (basically an alternative to the roulette wheel and ball image I mentioned before). Ok, I have gone completely overboard with this post so I might as well add a few more training ideas relating to this and that I have since shared on different occasions, including for example in Hong Kong earlier this year (see Filip – Session 2). Simply put, next to the delivering and receiving exercise from which I’ve started this, I’ve had the impression that we might be seeking for a similar sensation in most (if not all) other Aunkai exercises, and maybe even movement in general. While the ‘push walking’ exercise depicted above remains fairly small with regard to one’s exploration of finding the ‘weighted salad bowl under buoy’ feeling, there are other exercises or parts thereof that provide opportunities for a more exaggerated exploration of the same. 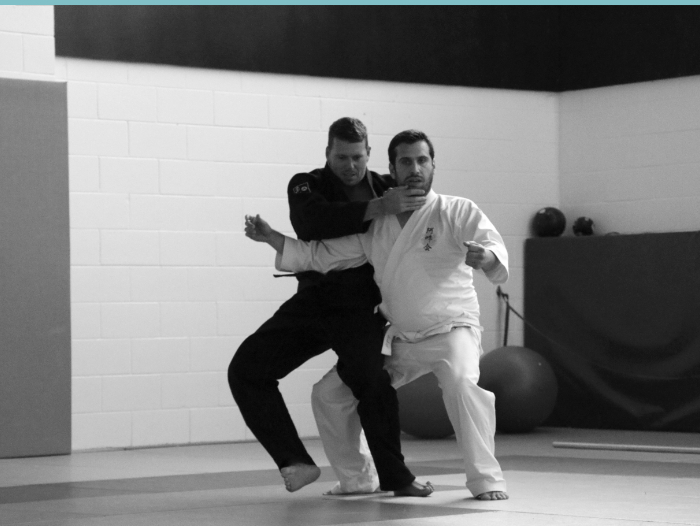 As a fan of starting out with exaggerated movements (both for learning purposes, as well as simply for the pure joy of movement), the exercise mentioned in the latter article by Xavier Duval (Seishin Tanren Dojo, Hong Kong) that I have introduced into some of my teaching sessions for this purpose goes as follows: have your head or other parts of the upper body displaced (basically to a slightly off-balanced position) and then lightly held in place by a partner (without moving one’s feet), and once that is done, moving one’s spine and feet to arrange one’s body underneath the new place of suspension again. I might be completely off-track of course, but I’ve found this exercise, as well as the whole story from which it came and that I have described here extremely enriching and beneficial to my practice. And there has been tons of other sensations, ideas, and possibilities that have come out of it all for me in consequence, both in terms of access to or understanding of other solo and partner exercises, as well as applications, and most people that have played around with this with me have found the same. Of course, we would gradually want the delay between upper displacement and lower realignment to become smaller, if not be simultaneous, but this might present a viable beginning that allows you to explore and feel something very clearly, before reducing it down. And while I’m at it, here’s a series of images from a recent Aunkai workshop here in Auckland that might help illustrate the idea using one example. The progression of the three images theoretically follows: 1) head or upper body displacement, 2) lower body adjustment, which in this case already begins the 3) resulting ‘application’. Since I have so completely failed to stick with my plan for this post, I should add one more facet of the sensation(s) and the set of exercises that I ended up focussing on here before I finish. I generally try to avoid using this term because it is used in so many different ways and has led and still leads to so many misunderstandings, but I would like to add that I do believe that the combined experience of one’s center and central axis is hugely relevant not only to martial application but also… ahh.. umpf.. ok… here it comes… ‘spiritually’. I suppose I’ll explain what I personally understand as ‘spirituality’ at a later stage, but let’s put it this way for now: First off, the spiritual potential of ‘finding one’s center’ is already amply obvious in these words themselves and so I don’t think needs any further explanation (at least here, but maybe later). 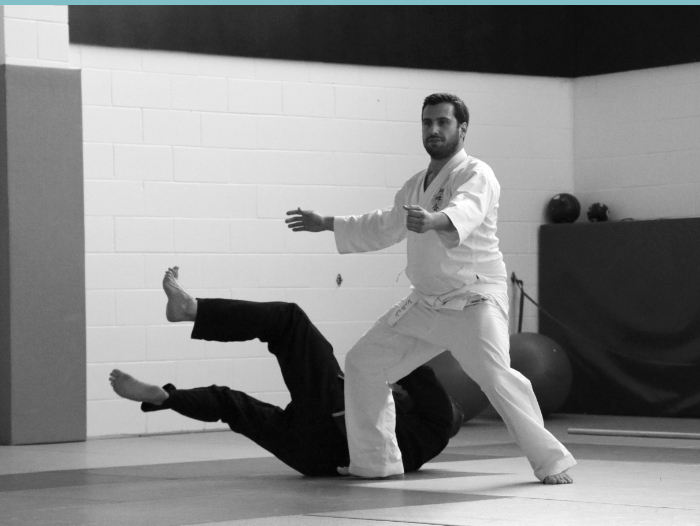 In this context, the martial arts merely provided a particularly opportune space, time, or environment that can facilitate this process, and are thus ‘a spiritual practice’ in the sense that they provide an opportunity to develop a sensation that might potentially change one. This, however, is not to say what direction this change might take, nor how (im-)permanent it might be. It simply opens a potential.